Mindfulness is a way of being. It is a process rather than a product or end result. To be mindful is to deliberately draw our attention to, and stay connected with, what is occurring, both internally and externally, without judgment. It is being in the present moment, alert and aware of how we are feeling, including what we are seeing, thinking and doing. A helpful way to understand mindfulness it is to think about what happens when we are taking a shower. When we shower, we may be instantly aware of stepping in the shower and beginning to shampoo our hair, but soon after, our minds are wandering to some event in the future or past. We may be reliving conversations, thinking about our to-do list, or solving problems, etc. We are anywhere other than in the present moment. We have essentially removed ourselves from fully experiencing the act of showering. In this advanced era of wireless devices and other distracting gadgets, we’ve become disconnected from ourselves and our experiences. This makes us vulnerable to instant gratification-based decision making instead of making decisions based on how those decisions impact our lives. These distractions also rob us of being aware of and enjoying the present moment, whatever it may be. 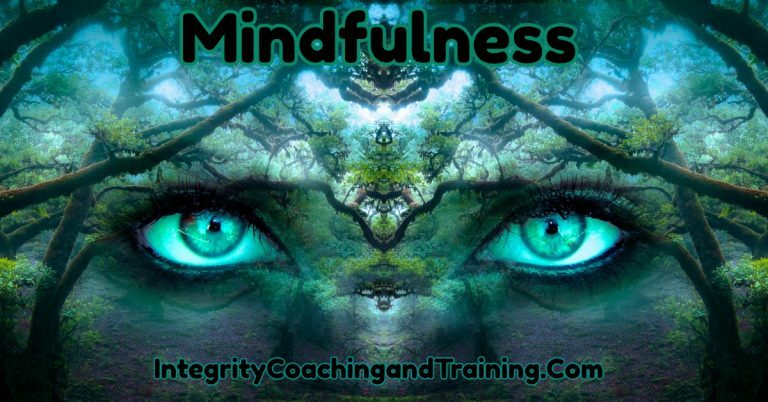 At Integrity Coaching & Training Systems our Mindful Living series will put you in the driver’s seat in the most spectacular car in the world; your life. This series will provide you with tips, tools, techniques and strategies to support you in Mindful Living. The more mindful we are, the greater the opportunity to choose how we want to experience life. With mindful living we can more easily choose to eat healthily, exercise more readily and speak to ourselves more kindly.